The 2017 theme for the annual Hanwell Carnival in London is Blues Brothers. I have my sunglasses and just need to borrow a man’s jacket, a thin tie, and a black hat. I can’t wait to join the Hanwell Ukulele Group (HUG) to strum and sing together on a float in the parade. Author BLOGmaidenPosted on December 31, 2013 May 3, 2018 Categories communication, piano, planning, sight reading, UncategorizedTags class, lessons, Maui, piano, UHMC4 Comments on Piano lessons: individual or group? It has taken 9 years to finally put together our first CD. Why has it taken so long, you ask. Last autumn, we decided to find a suitable location to record for our first CD. We have arrived at the final stage of getting our first CD out of the Monument House to the CD printers. It has taken 9 years to put together our first CD. Why has it taken so long, you ask. Read my blog “the long and winding road towards our first CD” to get an idea. Last autumn, we decided to find a suitable location to record for our first CD. 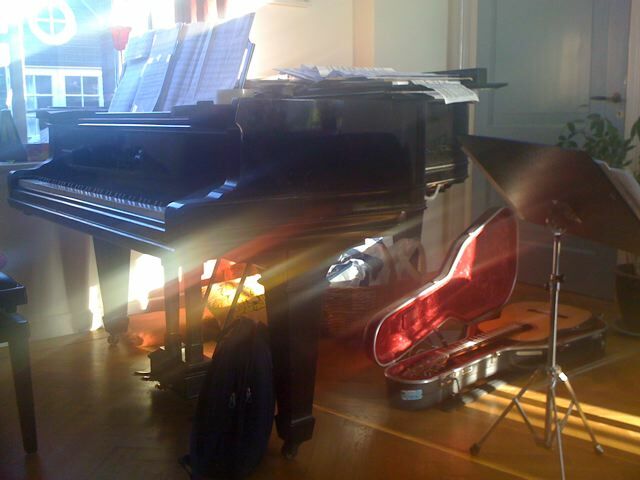 After a guitar duo concert in August 2009, we did a test recording at Leendert Meeshuis in Bilthoven. Surrounded by a forest, the building is named after a doctor who played piano to his patients. Hummel’s Potpourri was good enough to include on this CD but where? We tried recording at the church in Bennebroek where we had given a concert in April 2009. 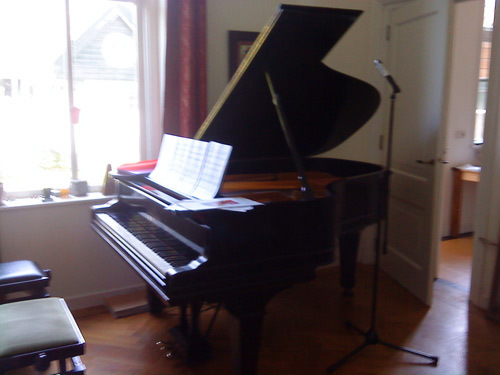 I liked the Bechstein, and the proprietor remembered us. After getting it tuned, we discovered that the church had too much reverb. We needed human bodies to bring down the echo. Next we tried both halls of the new building of the Pier K music school in Nieuw Vennep. The outdoor construction made it impossible to continue without long breaks. Still we managed to get the Polonoise (Polonaise) from the Variations op. 113 (65) of Giuliani recorded. It was September 2009. We had house concerts to organise, a guest from South Africa to welcome, and our own concerts to prepare for. Unlike the previous years when we changed programmes for every concert, we had stuck to one programme in 2009. We wanted to move on. We had to get it recorded. We decided to go for the sure thing. Hire a studio for recording. Immediately after the house concerts, we went to the newly built Centrum XXI in Utrecht to record ourselves. 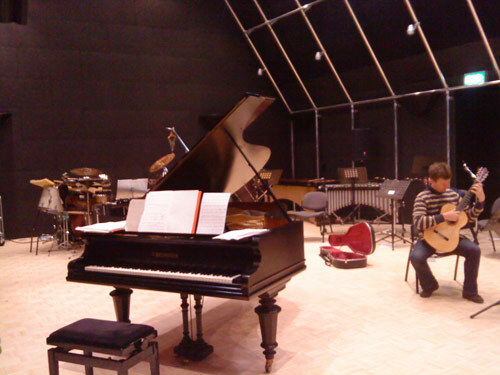 We were surprised to find various percussion instruments cluttered around the Bechstein grand. We had given a concert in this hall at the Utrecht Uitfeest in mid-September 2009. Our contemporary music programme “Pull, pluck, strum, bang!” worked well in such a new building. Actually the building was not even officially opened then. Ironically, the previous day we had played our traditional programme (what is on our first CD) in a 600-year old building in Utrecht as part of the Open Monument Day celebrations throughout the Netherlands. For a week, we dedicated ourselves to recording, listening, and re-recording Vivaldi, Hummel, Giuliani, Torroba, and Rodrigo. We agreed that Robert would edit the recording and I would work on the text. In mid-October, while I was in Italy, Robert listened to the recordings. Naively I had expected our CD to be ready by the time I returned in November. Even after I got back from Helsinki, it was still not ready. Surely it would be ready by Christmas. No, it wasn’t. Not New Years either. By Chinese New Year in mid-February 2010, I was getting very impatient. I set a final deadline. It has to be ready by the time we leave for Taiwan where a big family reunion awaits in less than two weeks. 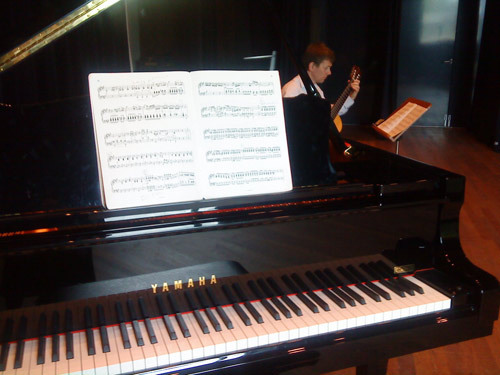 Below, Robert plays Asturias after a long recording day at Centrum XXI in Utrecht.